Well, we hope they are girls! Normally people stick to a new skirt or a magazine as an impulse purchase. 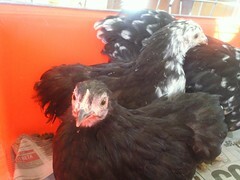 At CatoGardenFarm we prefer chickens. 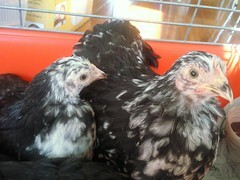 Pepper is the largest mottled pekin bantam, she is a week or so older and taller. 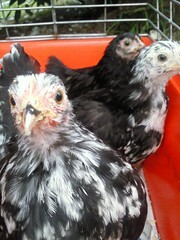 Salt is the smaller mottled pekin bantam. She has larger patches of white. 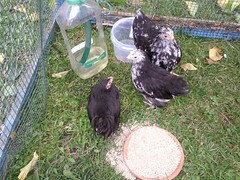 Jet is the smallest of the three and is basically black with a hint of white feathers on her head. 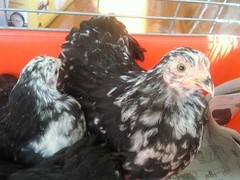 She may develop more speckle as she moults and grows new feathers. They came from Debbie in Kingston who had a beautiful assortment of mottled, gold, lavender and black pekins and a few other breeds as well. They new girls are about 8-10 weeks old and are now snuggled up overnight in a bed of dried grass in one of the portable pens under the top Moorpark apricot. 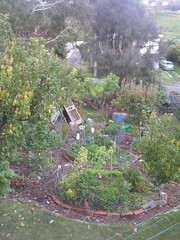 In the main vegie garden we have seven circles – one central (C0) and then 6 more in a circle around it, numbering starting from the closest to the house. And then we have another few beds, and a few more on the drawing board. Plan of Plantings - not to scale! Volunteers: kale, coriander. parsnip, strawberries. Volunteer: no room – tight plantings! Butternut pumpkins about 15 cm long. If the weather gods smile they might mature. Yup, we have a few different growing areas! 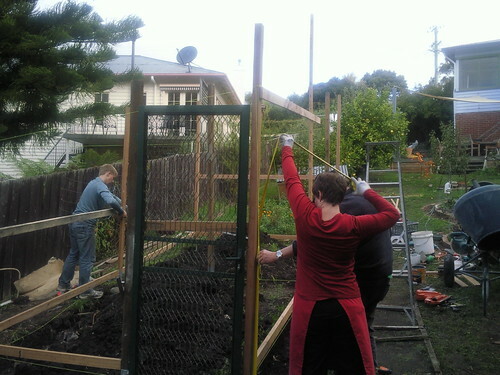 Planned beds – when we remove the old chicken shed, two or three will snuggle in between that side fence and the Williams pear. And another between the nashi pear and citrus grove as that is wonderfully sunny even at this time of year compared to say C5. And I need to think about not planting brassicas next February in so many places – a few too many beds have them which risks disease buildup. 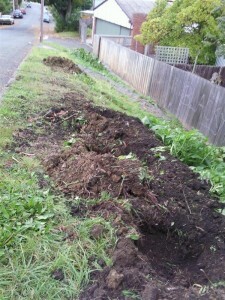 It was an issue of wanting to plant where the tomatoes were, and not having the centre bed properly cleared. This Autumn I have made sauerkraut, kimchi and indian lime pickle for the first time, and ginger beer several times. The idea of making sauerkraut intrigued me – sprinkling thinly sliced cabbage with salt to provoke the juices, and leaving it on the bench to start fermenting seems so counterintuitive to a lot of kitchen hygiene ideas! 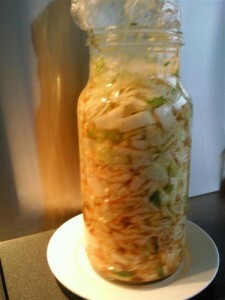 The sauerkraut came together pretty quickly – smelling sauerkrauty and producing the slime bloom on top of the brine that is normal. From a large cabbage we got about 6 jars of sauerkraut and I need to buy some more pork sausages to eat with it. I had several lunches of cold chicken and sauerkraut which was delicious. I’ve got red savoy cabbages planted now, and cabbage moths willing, will try some red sauerkraut in winter. This was inspired by a meal I had in Canberra back in January – pork and kimchi stirfry. 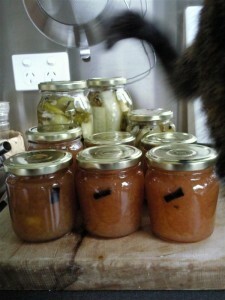 And Tigress in a Pickle had a recipe which I’d seen when getting distracted. The final piece fell into place with a beautiful chinese cabbage at the Farm Gate Market. 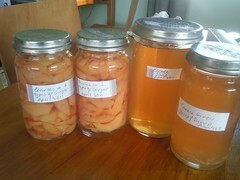 And I finally found a use for the large No 65 Fowlers jars (capacity 2.25 litres) we sourced in February. 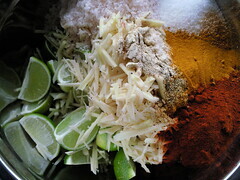 Once fermented, this turned out spicier than it tasted when first mixed together. The brine filled bag sits on top to make sure the cabbage stays under the surface and ferments rather than rots. 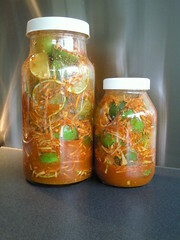 I added some finely chopped to a batch of corn fritters, and gave away a jar to Mum. When we get our pork (yum yum yum, a whole side is coming) I will try to re-invent the stirfry I ate a couple of months ago. Indian pickles recently came to my rescue at a residential event where the food was rather bland – a quick walk to the nearby supermarket gave the perfect pick-me-up to the dull food. 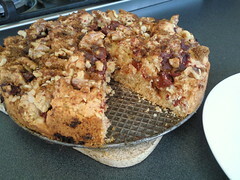 Again, Tigress provided the inspiration with the recipe. I found a bargain 2kg bag of perfect limes. Eumarrah, the local wholefoods and organic store, had the most gorgeous ginger – pale pink skin which could be rubbed off with a finger tender flesh and full of juice. After mixing it all together, filling a No 65 Fowlers, and then quickly finding another jar, the pickle began its 6 week sojourn on a sunny windowsill. Over the past few weeks the large jar has sunk down and is now about 3/4 full. It gets the occasional stir and sniff test. Can’t wait for this to be ready. The small jar (small? 950ml) went to try the sun in Sandy Bay. 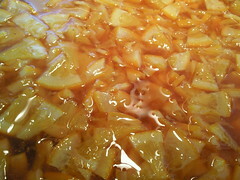 Many fermenting recipes suggest using a stoneware crock with a closely fitted lid which sits inside the crock to push down the cabbage under the brine. I really like using the glass jars as I can see what’s happening and the brine bag solves the submersion issue. 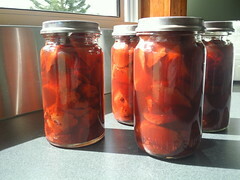 Next year – sour dill pickles done as a lacto-fermentation rather than pickling vinegar. Must plant cucumbers! Last year we planted 55 cloves of garlic with the plan that would give us a head of garlic a week for the year. 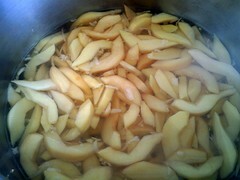 It grew well, produced well and we harvested in late December/ early Jan with only a few losses. However the plaits hanging in the garage are looking a lot less ‘full’ than this photo. The garlic is rather nice. We’d already decided we’d need to increase the volume. 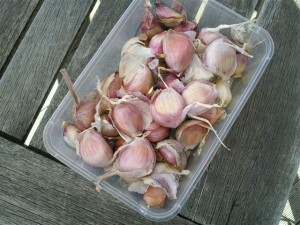 At the workshop down at Paul Healy’s farm last week he planted garlic which reminded me I must get ours in the ground. We’ve bought a few heads to plant. Eaten them and bought more. 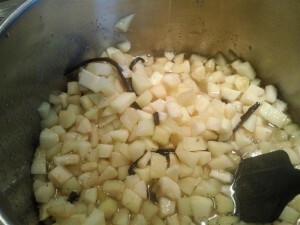 Following Paul’s advice I sorted through the cloves more carefully than last year – only the largest were planted, and the smaller ones put aside for cooking. I have planted a quarter circle of garlic in C2 this week [about 25 cloves], and the chickens have been helping clear C4 for another garlic patch. That will go in over the next few days. 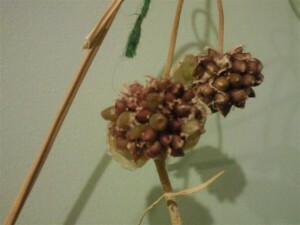 I also saved the tiny bulbils from those that sent up a centre stalk and will plant those in a pot to make garlic greens or grow them on for the following year. 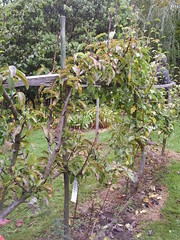 One should neve go to a fruit tree orchard open day after already placing an order for fruit trees. It’s not that you get disappointed that you wish you’d ordered this one over that one. It’s more that you discover you need these new ones as well as the ones you’ve already ordered! Okay, that’s ten. I’d remembered 9. Hmm. I’d remembered 7 from the second order. 19 rather than 16 spaces we need. 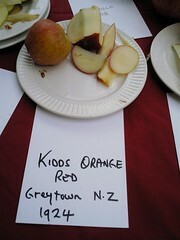 From the open day we learnt lots about espaliering and training apples and pears in particular. I’ve been reading the articles on the Woodbridge site and getting various books from the library and digging into some books we already had. Robin’s been reading about tensioning wires and posts. We’ve been eyeing off the inside of the front fence, the side fence at the bottom of the garden near the blackcurrants, the nature strip over the back fence. 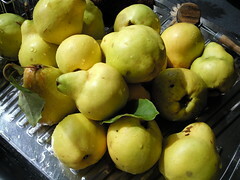 Quinces will go out the back as we figure they are less susceptible to the neighbourhood kids raiding the trees. Peaches and nectarines along the fence near the driveway as they get protection and sun. Finally the holes are dug! 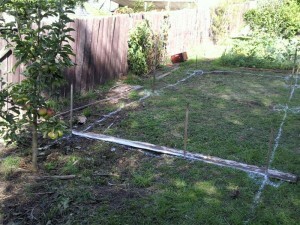 So we scrubbed out the marked holes and trenches at the bottom and went back to Plan A. A sensible sized chicken shed. One cube 2.4m square completely enclosed in Laserlite, with an attached netting run the same size. 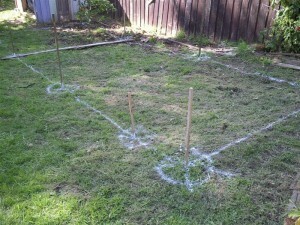 Holes for poles marked on the grass. Dimensions 2.4m x 4.8 m in total. Current shed is 2.4m x 3.8m but A frame which cuts down the usable space and makes it a pain to clean out and catch chickens in. 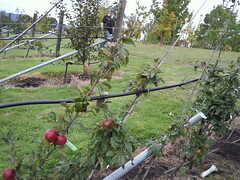 You can see on the left the Pink Lady Apple that nearly became a caged beast. It was simply too close to the back wall of the shed. Dirt seems to expand when it is dug up. Interestingly the dirt here is good to quite a depth. Well, good for sticky black West Hobart clay. When we went this deep in the front yard for French Drains Robin very quickly found a charming yellow sticky clay which we still find pockets of over a decade later despite lots of mulch and gypsum. 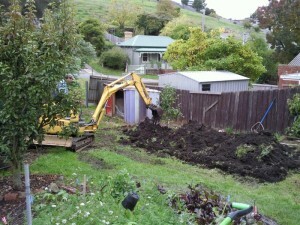 While Tim had the digger here we also had four holes dug on the back nature strip for some quince, pear and almond trees. 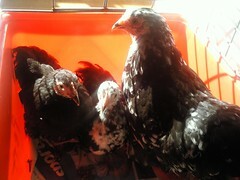 They are now filled with either compost that was nearly ready or litter straight from the chicken shed. Today we will add a scoop of worms to 1 of each, bit of an experiment with rotting down material before planting time in winter. What’s next with the chicken shed? Figure out how to build something with right angles on a slope. Ross (Robin’s father) is coming over for morning coffee to lend his expertise. The pile of concrete mix adorning the driveway is looking ominously large… Will report back. 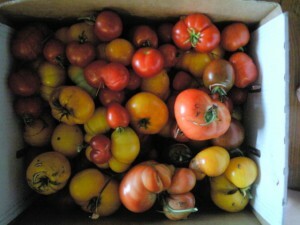 This summer was exceptionally mild and un-tomato-y. We bought our tomato plants at the sale held by the Friends of the Royal Tasmanian Botanical Gardens on 18/9/2010 which is quite early for Tasmanian tomatoes. They lived in the newly built greenhouse until the first ones were planted out on 22-24 October being Show Day weekend into C4. 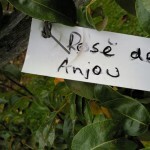 Others were planted out on 20-21 November into C1 and on the side fence. Wire cages to support the tomatoes were used to simplify tying them up. 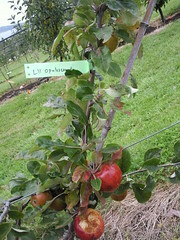 Despite being planted out a month apart, Stupice and Victoria fruited within a week or so of each other. 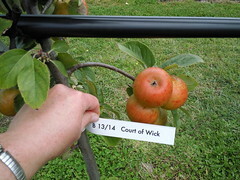 Victoria – 2nd earliest to ripen, table and bottling fruit, nice eating and ideal for grilling, lasted well through the season, still bearing in April. 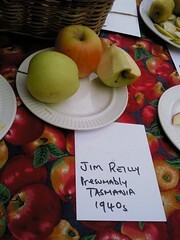 Stupice – 1st to ripen in greenhouse (and only about 10 days behind the Newcastle competition! 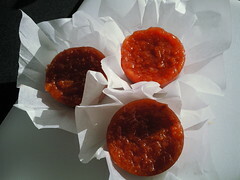 ), small to medium pointed fruit, lower seed to flesh ratio, lower juice, keeps well off plant, still bearing in April. 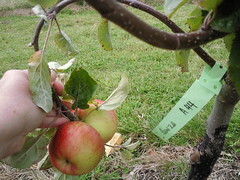 Mortgage Lifter – mid to late season, medium/large fruit, beefsteak (but not field) shape, later season. 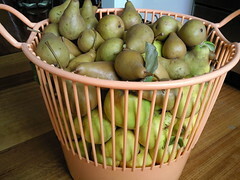 Hungarian Mobile – needs more staking/ cage training, large plant, mid season fruit. Azochyka – overly large yellow field tomato, skin marked badly, mild flavour. 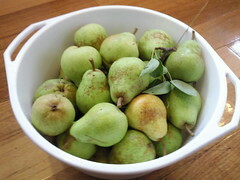 Zogola – short season, peach coloured, moderate yield. Overall - add more compost (as always), stake wire cages using hardwood stakes, plant into C2 and C3 next year, move side fence planting downhill to avoid disease buildup as I’ve used that spot quite a bit now.